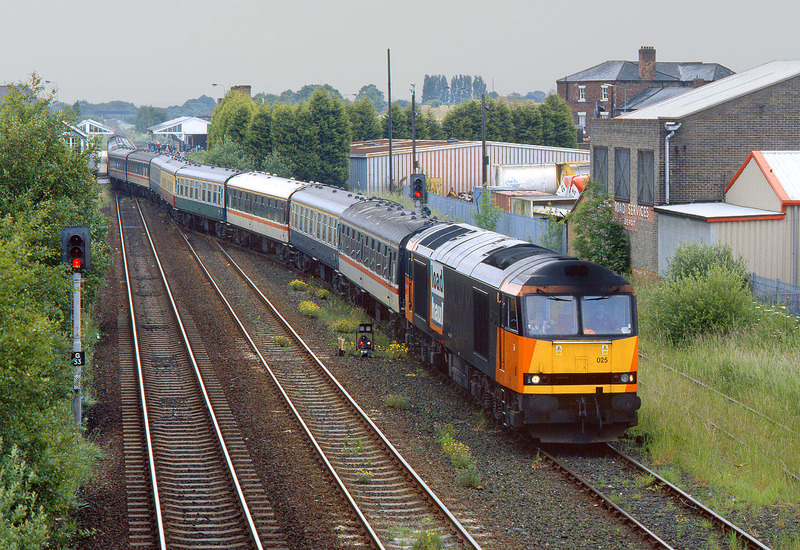 60025 slowly weaves across from the down platform at Goole station, over the level crossing and into the up goods loop with the Pathfinder Tours 'Spinning Spectre' railtour on 19 June 1999. The train had arrived a few minutes earlier as the 1Z90 05:49 Bristol Temple Meads to Goole, led by 47315, which had taken over the train at Doncaster. 37516 & 37679 had worked between Bristol and Toton, 56098 & 58001 between Toton and Worksop, and 66005 between Worksop and Doncaster. After a 90 minute break at Goole the tour headed back as the 1Z91 15:50 Goole to Bristol Temple Meads, with 60025 being replaced by 37516 & 37679 at Sheffield.